During the summer months I usually make it a point to read both for business and pleasure. Throughout the academic year, many great books, articles, websites, and other forms of media come across my desk, but alas most of them get put aside in favor of more pressing tasks. Thankfully, the summer allows me to relax a bit and catch up on some reading. 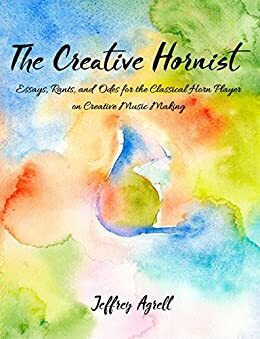 First on my list this year is Professor Jeffrey Agrell‘s new book The Creative Hornist: Essays, Rants, and Odes for the Classical Horn Player on Creative Music Making , which actually fits very nicely into both the business and pleasure category. His writing is well thought out, eminently practical, and just plain fun to read. It is an excellent companion to his book Horn Technique (see review here), and contains both expanded versions of previously published articles (see The Horn Call) as well as new material. Those who are familiar with Agrell’s work will know that he has an incredibly fertile mind, full of intriguing thoughts on both large and small scales. As with Horn Technique, my mind boggled at the sheer amount of ideas found in these pages, any one of which could become the basis for extended study. To me, The Creative Hornist is less horn-oriented than Horn Technique, and provides a template for teaching and studying on any instrument. The bottom line is if you are a musician, you should read this book! The topics he covers range everywhere from reinventing the dreaded undergraduate “scale test” to general ideas on creativity (the SCAMPER method). Other chapters address ways to incorporate technology and improvisation into the traditional paradigm of horn lessons, which Agrell dubs the “Chicago Model” – i.e. the path to becoming the next Principal Horn of the Chicago Symphony Orchestra. This is a path which Agrell acknowledges has great merit, but which can also result in a relatively narrow range of musical skills. One theme that comes through in every chapter is that creativity takes work! But Agrell’s book takes the mystery out of what being creative actually is. Because teaching and learning this way goes against the established paradigm in music schools, it may initially present some difficulties. However, it is arguably just as effective at training competent players and almost certainly better (in my opinion) at developing overall musicianship. Needless to say, I am eager to try some of these ideas with my students this fall. The Creative Hornist is a great summer read to keep you inspired and give you a running start for the fall semester. For more information, visit the book’s website, http://thecreativehornist.com/.